Janice Leigh (Clark) Bray, 93, former resident of Madison and Milford, CT, passed away on January 30, 2019 at Crosby Commons in Shelton, CT. She was born on June 20, 1925 in Rocky Hill, CT, the daughter of Mason Dayton and Constance (Gilbert) Clark. Janice graduated from Wethersfield High School in 1942 and was working at Fenn Manufacturing in Hartford, CT when she met her future husband, Russell Frederick Bray Jr. They were married on October 26, 1945 in Springfield, MA. She and Russell moved their family from Rocky Hill to Madison, CT in 1957, where she was active in both the Girl Scouts and the Cub Scouts, serving as a scout leader for many years. In 1967, the family moved to Milford, CT where Janice was very involved with the Woodmont United Church, serving on the Education Board and as a deaconess for ten years. She was the head of the Sunshine Outreach Group and in 2000, was named the church's "Woman of the Year". She worked as a bookkeeper at Eldorado Tool and then at Centrig, both located in Milford, prior to her retirement. She excelled in rug hooking and rug braiding, quilting, knitting and sewing. In her time at Crosby Commons, she took up painting again, producing many works of art. She also enjoyed bird watching, flower arranging and camping. Janice is survived by her son, Richard (Mary Ellen) Bray; two daughters, Rebecca (Nancy Deadman) Bray and Beverly "Bonnie" (Jim) Ehmann; her brother-in-law, Alfred Marotta; 8 grandchildren; 16 great grandchildren; two great-great-grandchildren; as well as many nieces and nephews. 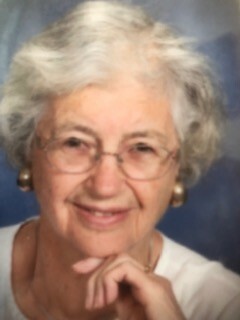 She was predeceased by her husband, Russell in 2014 and by her sisters, Constance "Bev" Lasher and Olive Marotta; her brother, Newell Gilbert Clark; her brother-in-law, Tom Lasher and her sister-in-law, Dorothy (Trepal) Clark. Janice was an artistic, gentle and gracious woman and these traits encouraged the creation of great and lasting friendships throughout her life. The family wishes to thank the staff and residents of Crosby Commons, as well as our mother's faithful friends and neighbors, for making her last years so joyful. We also wish to thank the staff at Reliable Care and Constellation Health Services, especially those that comforted her during her last days. A private service will be held at a later date. In lieu of flowers, donations may be made to a charity of your choice.